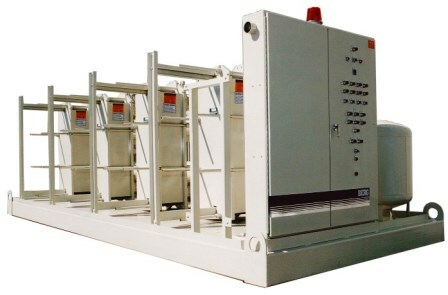 Heat Exchanger Packages | Berg Chilling Systems Inc.
An industrial heat exchanger package is a device that facilitates transfer of heat from one fluid to another. Some common types of industrial heat exchangers are shell and tube, spiral, and plate heat exchangers. An increasingly popular type is the plate heat exchanger, which consists of many thin plates pressed together. The plates are stamped with grooves, so when they are placed together, the grooves create spaces or channels for the fluids to move through. The hot fluid will pass through the space created between plates 1 and 2, while the cold fluid will move between plates 2 and 3, the hot fluid between plates 3 and 4, with this alternating pattern continuing for the whole heat exchanger. The grooves are designed so that the fluid moves across the whole plate. This, combined with the large number of plates, creates a very large surface area. The grooves also ensure that the fluid is kept in a turbulent state. These two items both increase the rate of heat transfer, making the plate heat exchanger the most efficient style of heat exchanger. Gasket. Between the plates, there are gaskets that ensure the fluids do not mix internally or leak from the assembly. The advantage of this style is that plates can be removed and cleaned, and gaskets can be replaced if worn. Welded or brazed. In this style, the plates are welded or brazed together to prevent the fluids from mixing or leaking. 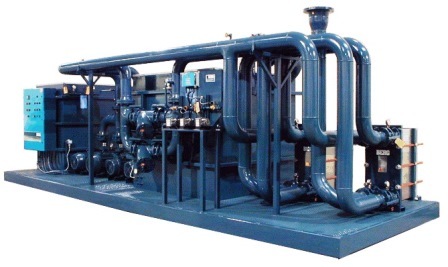 The advantage of this style is that the heat exchanger can be designed for higher pressures and temperatures or in cases where readily available gaskets may not be compatible with the fluids. Semi-welded. This style is a combination of the two above. The channels for one of the fluids are welded together, while the other have gaskets. It is used in cases where one of the fluids is a potentially hazardous or high pressure fluid, while the other is just water. Heat exchanger packages can be used in a variety of ways. For example, if your tower water is extremely contaminated due to the external conditions, a heat exchanger can be used to isolate the tower water from your process equipment. This will save you from unnecessary maintenance, and possibly extend the life of your equipment. 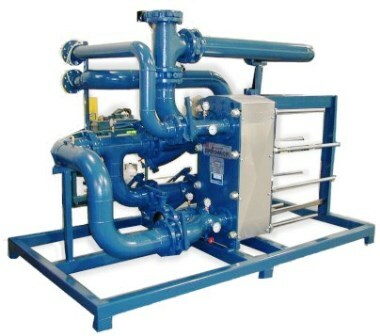 A heat exchanger can also be used with a chiller if what you are cooling is unusual or hazardous. We would design the chiller with glycol or water, and utilize a heat exchanger for the glycol to your fluid. 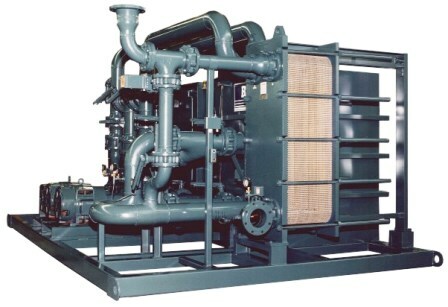 This would keep the chiller a standard unit, and reduce the overall cost of the project. 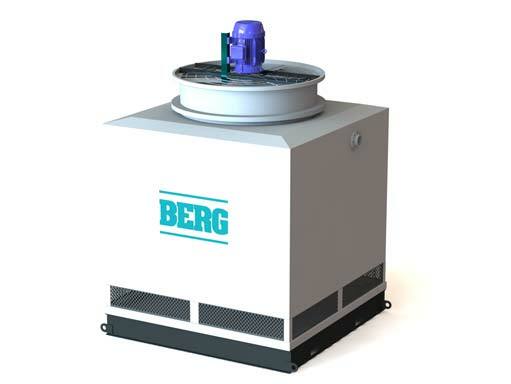 Berg’s heat exchanger packages are optimized and skid mounted for ease of installation. We can ship the heat exchanger separately or incorporate it onto one of our chiller or tank skids to further decrease work in the field. The following are a list of options we can add to meet your needs. Mounted on a structural steel base. Isolation valves on all connections. Pressure and temperature gauges on all connections. Drain valves on bottom connections. Galvanized or stainless steel drip pan. Insulation Y-strainers, with or without a bypass, on inlet connections. Modulating 2 or 3 way valve pre-wired to a controller for temperature control to +/- 0.5 F.